Adding a Xantrex PROwatt SW inverter will increase the power options in your motorhome. Inverter technology is nothing new to the RV industry, but for owners of older or less feature-filled coaches, inverters may have been deemed too expensive and complicated to install, requiring major rewiring of the motorhome, not to mention a sizable investment in hardware. Introduced in 2009, the Xantrex PROwatt SW series of inverters, with available transfer switch, makes true sine-wave built-in inverter power available, and much easier to install. 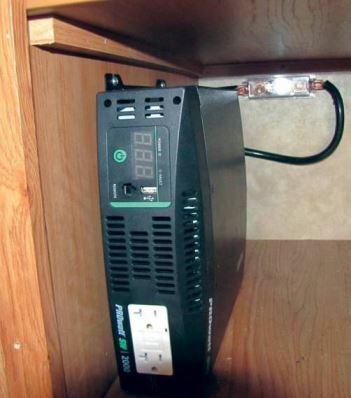 Inverters are great devices for RVers who like to boondock or camp without hookups. An inverter takes direct current (DC) stored in a battery bank and converts it to usable alternating current (AC) to power applications ranging from a shaver to a microwave oven. The only restrictions are the size of the battery bank; the battery cable size; and, of course, the size of the inverter. In addition to convenience appliances, inverters can power equipment such as CPAP machines and other accessibility-related equipment, opening the world of untethered RVing to many who otherwise couldn’t be away from a power source. Inverters are rated according to their watt output in both continuous watts and surge watts. Many devices require a surge of power when starting that is higher than what’s required to run the equipment after it has started. The Xantrex PROwatt SW series inverters come in three sizes: 540, 900, and 1,800 continuous watts, with corresponding 600, 1,000, and 2,000 watts maximum, and 1,200-, 2,000-, and 3,000-watt surge capability. 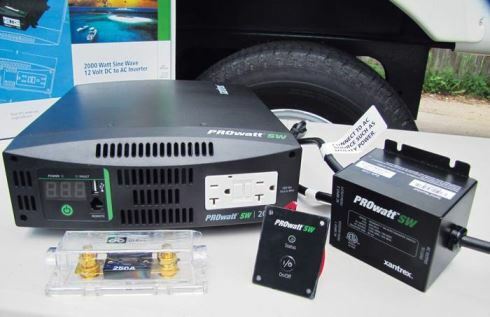 The PROwatt SW series inverters are true sine-wave inverters. What this means, in simple terms, is that the power they produce is the same as is produced by your electric utility company at home. This is important in today’s world of technology, where many devices won’t function properly unless they are fed pure sine-wave AC. An example would be the aforementioned CPAP machine, or power-sensitive electronics such as computers and LED TVs, which require true sine-wave power for operation. As mentioned, inverters have been installed in RVs for some time, and some motorhomes are prewired for an inverter. The AC circuits in the coach are wired so that select circuits run through the inverter to a downstream breaker panel (or an isolated load-side section of the main panel) and then to load, depending on the configuration. Many coaches are equipped with inverter/chargers that provide charging and 12-volt-DC power to the coach when plugged in to a shore power connection or fed by a generator. When off the grid, the inverter can be turned on to provide 120-volt-AC power to the coach, usually on selected circuits. Most entry-level motorhomes are not wired for this type of technology. They typically include a factory-installed AC/DC converter/charger that works like this: A campground connection cord feeds AC into a converter/charger (sometimes through a small breaker panel), which then converts/switches/provides power to the motorhome’s 12-volt-DC lights, fans, and pumps while also delivering a small charge current to maintain and charge the battery bank. If you wanted to install an inverter, you had to put in a separate electrical system just for the inverter, or segregate the circuit or circuits you wanted the inverter to power permanently or via a switching assembly to avoid having the inverter power the entire coach, risk an overload, and possibly damage the unit. The beauty of the Xantrex PROwatt SW series system is that it can be installed in a motorhome much more easily than many of the alternatives. With the addition of the transfer switch, the circuit(s) that are powered by the inverter automatically switch over to inverter output when there is no shore power source. This is not to suggest that it is a simple installation. Various considerations must be reviewed prior to installing the unit. 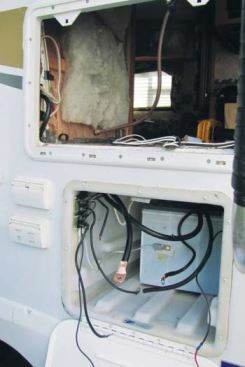 But once the job is completed, your RV will have a neat, professional, out-of-sight inverted power source. Selecting the right inverter is largely dependent on two factors. First, what are your energy requirements, and how long do you need to run them? Second, how big is your battery bank, or how big can you make it? Again, the thing about an inverter is that it takes stored DC energy and makes usable AC power from it. This means there must be adequate stored energy in the batteries, and you have to have a way of replenishing that energy from another source, such as solar power, wind energy, shore power, etc. Xantrex makes this determination a bit easier, thanks to a plethora of resources on the company’s Web site. The RV on which I did this installation had been equipped with a 35-watt solar charging system, a Xantrex TrueCharge2 60-amp charging system, and dual 6-volt-DC deep-cycle batteries wired in series to produce 12 volts DC. Frankly, the batteries in the RV are not sufficient for the 2,000-watt inverter used for this installation, but space limitations dictated that only those batteries would be used. That said, it would be possible to add vented battery boxes in the front storage compartment to increase that capacity should the coach owner decide to in the future. The 35-watt solar panel also is less than ideal for the application, but the system is expandable. 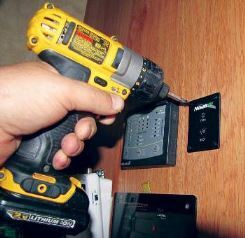 The installation requires a number of additional items, including the proper cabling for the inverter selected; a fuse assembly for the battery cables; similarly rated terminals; the transfer switch; an optional remote control; properly sized AC Romex cable with a junction box that has strain reliefs; and a selection of screws for mounting components. It is important to note that the transfer switch is rated at 15 amps and is prewired for the various connections. Since it plugs in to the front of the inverter, it must be mounted in close proximity to it. To begin the installation, we had to disassemble the refrigerator cabinet and remove the circuit breaker box to access the installation space we selected and to run cabling. When doing the installation in your motorhome, you (or your installer) must decide where the best installation location is and what needs to be removed from the motorhome to complete it. Since we were using the Xantrex transfer switch, the installation needed to be close to the circuit breaker panel. It is possible to run additional wiring to the panel if the inverter and transfer switch must be installed away from it, but the wiring size must be carefully calculated and the circuit protected. For a number of reasons, we opted to install the inverter in the pantry cabinet. First, the batteries and the circuit breaker panel were in close proximity, which made the installation simpler. The remote panel was to be installed with the other remote panels, which were mounted on the refrigerator cabinet next to the door; so, again, easy access. Third, wiring the transfer switch would be relatively easy. We could hide it in the cabinet and run the plug through the cabinet wall to the front of the inverter. Finally, the PROwatt SW2000 has two receptacles and a USB charging receptacle on the front, so mounting it in this cabinet provided access to the receptacles right from the middle of the RV’s living area, and small USB devices could be charged with the cabinet closed. The installation was straightforward and made easier by the detailed instructions that came with the inverter and transfer switch. Xantrex technical service is available by phone should you have any questions, and technical resources are available on the company’s Web site. Selecting the AC circuits that would receive power from the inverter required some testing and reconfiguring. The coach owner wanted to be able to use the inverter to run a CPAP machine in the bedroom; to power the entertainment center; and perhaps run the microwave oven as well. To accomplish this, we had to determine which circuits were associated with these outlets, and wire them into the inverter transfer switch. We kept the microwave oven on its own circuit and combined the entertainment center and CPAP outlets on the same circuit, protected by a 15-amp breaker so as not to overload either the wiring or the transfer switch. With this configuration, nothing used in the RV will exceed this limit on a regular basis. Once installed, we proceeded to test the system, including the transfer switch. The system worked flawlessly. Field-testing continued to show that the Xantrex PROwatt SW2000 was a good choice and gave the coach owner more electrical freedom than he previously had experienced. More information about the Xantrex PROwatt SW series of inverters can be found at www.xantrex.com or by calling (800) 670-0707.